In 2019 we know that as a missing person psychic detective Noreen Renier did not find the son of the Brewster family aboard the plane. Likewise after more than three decades of Renier's claims to the contrary we know neither the missing daughter of the Porter family nor the missing brother of Massachusetts realtor Jessica Herbert were found by author Noreen Renier. Like the dead pilot Charles Principe all were found not because of any fantasized paranormal claims made by Noreen Renier, but instead by other searchers completely apart from her psychic charade. John Merrell as early as 2006 showed that Jessica Herbert's testimony in 1986 helped convince a jury that Noreen Renier was an authentic psychic who found the plane. Jessica Herbert testified that Noreen Renier described the events surrounding the crashed aircraft, and that the plane had gone down at the junction of three letters provided by Renier. Realtor Jessica Herbert implied that psychic Renier was remarkable when she stated "Well, as it turned out those letters were the first letters of three towns and where the plane went down and as a matter of fact, it took the authorities a couple of days to determine whether it went down in Templeton, Gardner or. . . I forgot the name of the third town, but she had given me the letter of the three towns. It had gone down right at that point." As noted, the claims that Noreen Renier was able to triangulate the location and picked three correct letters must have amazed the jury when they heard about Renier's mapping abilities. 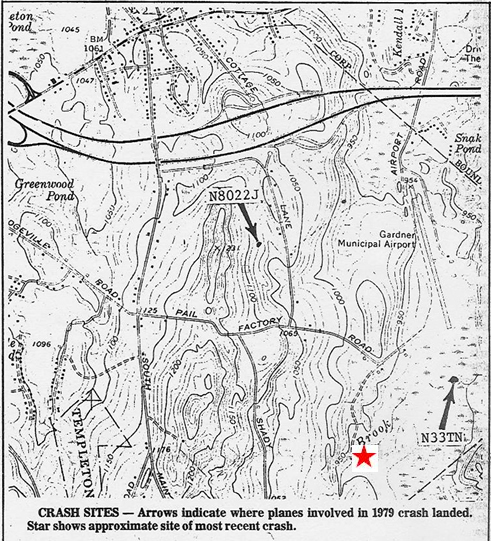 Jessica Herbert testified that this junction point "was right where the plane was down, it was right where the actual town lines crossed and so it was out in the woods, but Templeton and Gardner and I forget the name of the third town, but the three of them where they meet, where the town lines are together, at that point." According to Merrell the testimony by Massachusetts based Jessica Herbert woke up the jury. He stated that "to the jury it was suddenly clear that Renier had an extraordinary psychic gift. But Jessica Herbert went even further." In her testimony Jessica Herbert stated that Noreen Renier literally "took a map and with her finger put it on Gardner. . . and it turned out that the longitude and latitude were correct for Gardner!" In 2019 we know there was a serious problem with Jessica Herbert's testimony. Her testimony doesn't match the truth --- not even close. It appears she likely exaggerated to further push the fantasy of her brother being a hero at the end of his life. Not a passenger in what may have been an illegal drug drop at what normally would have been an abandoned and dark airstrip a that time of night. According to Merrell "While Renier continues to cite Herbert's testimony as factual it was in fact a fantasy played before a jury." The actual crash site is surrounded by three communities, including the small settlement of Pitcherville. All of them are within approximately 4600 to 5400 feet from the crash site. So surrounding the crash site (at a mile or less) are Gardner, Templeton and Pitcherville. Herbert noted Gardner and Templeton but could not recall Pitcherville. But even if Jessica Herbert had recalled the settlement of Pitcherville the letters for each town would have begun with 'G-T-P'. 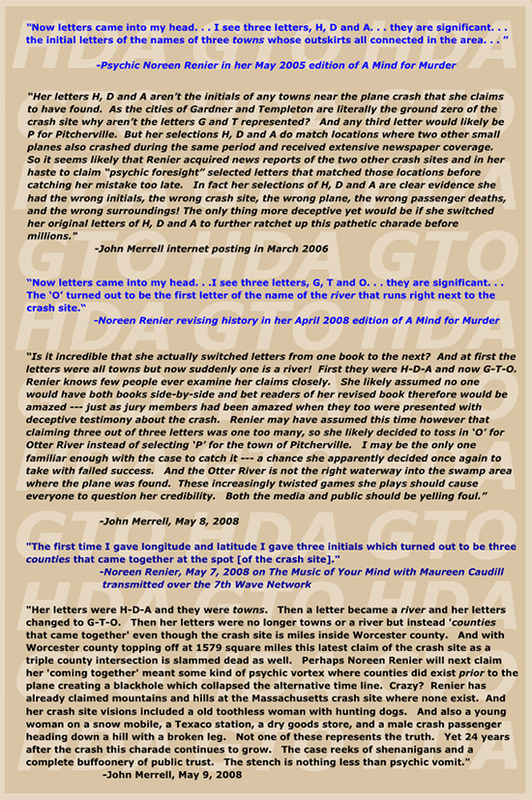 Yet even Renier's 2005 edition of her book A Mind For Murder cited that the letters were H, D and A and these "were the initial letters of the names of three towns whose outskirts all connected in the area marked by the longitude and latitude." So clearly Jessica Herbert gave support where again none was actually deserved. And during the investigation by Merrell he showed the letters 'H-D-A' provided by Renier are either dead wrong or attempting to use cues that are off by miles from the actual crash site. Or match other crash sites elsewhere. So even in her own book she can't seem to get it straight whether they do represent towns or they don't. But it doesn't matter. There are no towns with the letters H, D or A that feasibly overlap or connect at or near the crash site. Unless one considers another explanation which explains a possible reason for her error and a likely "psychic connection" with the two other planes crashing in the same area. (Click here for a short explanation). 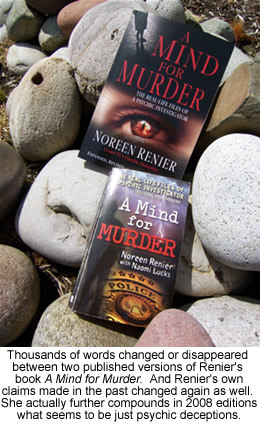 Interested in viewing the actual pages of the 2005 and 2008 editions of A Mind For Murder where Renier flipped her selections from HDA to GTO? Click here for the link to four pages of conflicting statements between 2005 and 2008. Noreen Renier has continued over the past decade to repeatedly modify her claims before the public, including in her 2010 appearance near Las Vegas and in February 2012 at the Clinton School of Public Service. Over ten years her claims of specific events have changed time and time again. Listen below to the 40 second audio segment from The Music of Your Mind with host Maureen Caudill originally aired on 7th Wave Network May 8, 2008. In the above audio clip (taken exactly 49 minutes into the webcast interview), Renier claims her initials were not towns or a river but intersecting counties. Previously she said two cities and a river. But neither cities, a river, or the names of counties match up with her changing letters at the Gardner crash site. Renier also falsely states the Civil Air Patrol had given up their search and closed the case only to re-open it after she provided new information. None of those claims are true as the Civil Air Patrol never closed the case and in fact had never spoken to Noreen Renier directly. Local resident Carl Wilber along with his daughter Cheryl, and entirely independent of Renier and her fantasized letters, numbers, and inaccurate visions lead the search teams to the proper location of the crash site. Just two years later, during a videotaped presentation in Las Vegas in 2010 Renier changed various parts of her story even further. These continued revisions and distinct differences support John Merrell's long held mid 2007 summary that her criticism of his investigation as outlined in the 2005 edition of A Mind For Murder lacks credibility. The facts are that the longitude and latitude for the airport (N4233.0, W07201.0) were already known before the crash, and neither mystery numbers nor mystery letters had anything to do with locating the crash site. The plane was found just 2700 feet south of the end of the runway by people who didn't use longitude or latitude. But Jessica Herbert's testimony skipped reality and built a story founded upon pure fantasy. Jessica Herbert restated and even enhanced Renier's elaborate fantasy about the letters along with Renier's actions. And Herbert made statements which weren't just in error --- she repeated fantasized claims. And if Renier had told any of the local police or sheriff's personnel (with two city police departments within a short drive of the crash site), they would have immediately made the relatively quick search from the nearby access road to reach the plane. It is clear that the Wilbers never received any such information which lead them to the crash site. Court TV psychic detective Noreen Renier may have been "breathless" when numbers and letters floated through her mind, but they had nothing to do with the plane being found. But this psychic hocus pocus apparently made Jessica Herbert a psychic missing person believer --- and then she falsely repeated the letters matched the crash site in her own words. Renier's Oregon attorney Lee Werdell even drew things out for the jury and spent several minutes discussing headings, degrees off the airport, and coordinates. A quote taken directly from the Oregon court transcript has Renier's attorney Lee Werdell stating "I'm not an artist, but this is a circle; this is zero degrees, that's 90 degrees, 180, 270 and 360. All right, if that is 180, about 15 degrees to 195 would be something like this, maybe over to there. Two hundred and twenty five is halfway between 180 and 70, I believe. That's 45 degrees. That's 45 less 70. Twenty five from 70 is 45 degrees, so 225 degrees is right dead center between the two 70 and 180. If you're in an airport and you start flying at 195 heading, it will be something like that. If the heading you should have been flying is 225, it will be something like that." John Merrell in 2006 recalled watching Lee Werdell spend minute after minute before the jury. "It was pretty apparent that Werdell's mission wasn't to do much beyond making numbers, angles, headings, degrees and distances seem important to locating the plane crash. He won the case for his client by challenging the concerns of psychic fraud by Noreen Renier but in doing so he made it seem Renier was a psychic Einstein of aeronautic trajectories and navigational mapping. But longitude and latitude or the distance to any city had absolutely nothing to do with why the plane was found by the Wilbers. Absolutely, positively nothing. But in the eyes of the six member jury Renier became a female Einstein with amazing missing person psychic powers." Throughout descriptive pages about forested hills, gorges, and mountains around the crash area, Renier's book states that "the area looked primitive, undeveloped. I caught glimpses of rocks below . . . and big gorges underneath me." Yet after local residents Cheryl Wilber and her father Carl found the plane on the ground, Cheryl was flown by helicopter back to the site and could see nothing of the plane even when hovering directly over the crash site --- just level treetops about the crash site. Hemlock trees and dense undergrowth prevented all visual spotting of open ground around the airplane from the air, with the only gaps being the lakes and swamps. And Renier in her 2005 edition of A Mind For Murder failed to note the waterway which feeds the crash site swamp area or further away Snake Pond, Kendall Pond, Otter River, Bents Pond or even Crystal Lake, which extends north to south for more than a mile. But did she then also decide to avoid a perfect score and substitute "O" for Otter River instead of "P" for Pitcherville? It may not be a township on the map but perhaps she assumed that it would still be considered a hit by most readers. Not surprisingly she never mentions that she originally selected three other letters (H, D and A) in her 2005 edition of A Mind For Murder. Unlike Noreen Renier, critic John Merrell actually walked much of the area surrounding the airport and drove all of the streets and unpaved roadways nearby. "I even walked up towards a sand pit and wandered off-road around the Templeton Brook runoff area into portions of a large boggy swamp area." Merrell followed the outer rings around several swamps, ponds, and lakes. "I spent two days speaking with dozens of neighbors and Gardner and Templeton citizens in the area. I spent several hours near the airport actually walking the outside of the 3000-foot runway and stood at the southern end of the runway looking south towards the crash area. It doesn't take psychic imagination to visualize the first 2000 feet off the runway (the 2000-foot clearing is cited in airport landing data), as there are no trees and no large exposed outcroppings of rock. It is essentially (as seen in early June 2006) an unobstructed swamp, dense with mosquitoes." In her book, A Mind for Murder, Renier stated that search members "followed directions that I provided when I was in the plane --- landmarks, speed, sharp turns, longitude and latitude --- and they saw what I had described." However, we now know from those who found the plane that Noreen Renier's delusionary tales are not what they saw. They saw a completely different scene. And the phrase Renier uses --- "when I was in the plane" --- only adds to the confusion when one attempts to carefully catch up with her meaning. She was never in any search plane above the snow and frozen marsh near Gardner during January or early February 1984. Only in her mind. Noreen Renier didn't point out a plane window and actually identify landmarks below where others could see them, or call out air speed while in measurable and specific locations relative to the surroundings, or offer corrections in turns while aboard a plane. Her directions, travel speed, aircraft turns, and longitude and latitude were merely part of the fantasy she created as she sat in a comfortably heated room inside her Virginia home, 463 miles away. And her thoughts came more than a week after police had been informed of the crash near the airport and the media had extensively reported on searches in weather so severe that search parties were recalled at times. Noreen Renier showcased her lawsuit with the aid of several strong witnesses including FBI Special Agents Robert Ressler and Mark Babyak, and Babyak's his ex-wife Jessica Herbert. And a third FBI agent who flew a search plane. According to Merrell, the jury "kept hearing the letters FBI repeatedly from Noreen's attorney and repeated references to a lecture given by Noreen Renier at the FBI Training Academy, arranged with the assistance of Robert Ressler. And of course Jessica Herbert was both the ex-wife of an FBI agent and the sister of Arthur Herbert, who died in the crash. It was the psychic missing person case of the century verified in a courtroom --- but a bogus charade." 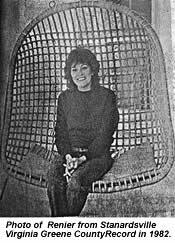 This link to members of the FBI has helped create pseudo criminologist Noreen Renier's notoriety among police psychics and other psychic detectives. Carl Wilber told Merrell in June 2006, "I just told people who asked that they were all dead when we found them. . . . [Until May 2006] I'd never heard about any psychic. . . . She [Jessica Herbert] would rather believe a psychic than me. . . . Why people think that way I don't know." It appears Jessica Herbert would prefer to have her family and friends believe a falsehood about her brothers death rather than the sudden and immediate death determined by the medical examiner. Indeed Jessica Herbert according to Merrell continues to promote the excuse that any comments she might make would cause grief to her family. Merrell notes "Jessica Herbert has never apologized for her testimony or for her continued support of this psychic fantasy. Nor has she answered whether she or her mother met with Carl and Cheryl Wilber soon after they found the crash. At least one member of the Herbert family did according to the Wilber's. If so the Herbert family knew the truth before Jessica Herbert testified that Renier's fantasy was accurate. What kind of person is it that promotes a fantasy before a jury and then walks away to allow a jury to decide between the fantasy or the truth? Was her brothers death worth promoting a facade as a hero in his final moments alive? Did she have any reservations as she watched me fail in court in 1986 based in part on her testimony? Or is there another reason?" 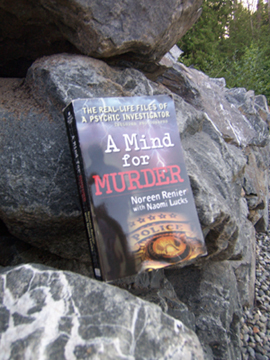 Noreen Renier is touted by many as "the best" among police psychics. Her rates for a private session (typically about 60-90 minutes in length according to a previous web site) climbed from $40 in 1985 to $1,000 and beyond. In the Lynchburg News and Advance on July 31, 2005, the reporter noted, "Moreover, $1,000 isn't all that much to Noreen Renier anymore -- it's what she charges for her services. . . . 'It used to be $600,' [Renier] said. 'I actually raised the price to discourage people, because I've got more work than I can handle.'" In 2019 her posted website showcases U.S. pricing at $1000 and more for one telephone session typically 45-60 minutes in length. Yet it's apparent Noreen Renier has long lost credibility and clients. Her website traffic has slowed to a crawl since 2005 when the facts began to emerge about her airplane crash claims. Former clients indicate over the past ten years she's accepted fees near 20% of her website postings. Between 2017 and 2019 she's appeared before three Florida judges in unrelated matters (Judge Elizabeth J. Starr, Judge Keith A. Carsten, Judge Gisela T. Laurent), and financially may be desperate as her clients have discovered her lack of credibility in federal courts. Yet from the time of the Piper PA-28R-200 plane with tail number N55495 crashed until it was found on February 10, 1984 the local newspapers covered the case extensively. On February 15, 1984, a local newspaper noted that Arthur Herbert had boarded with Carolyn Porter, Robert Brewster and pilot Charles Perry --- but two days later the newspapers reported Perry had used an assumed name and was actually Charles A. Principe though he went by Chuck at times. Did Charles Principe select to use the name Charles Perry because a real Charles Perry (click here) was both a pilot and hero during World War II? And more importantly, why didn't the "amazing psychic" who claimed to be so accurate about events surrounding the crash mention to authorities that the pilot wasn't who he claimed? We get only failure after failure when Renier's psychic claims are compared with the actual events. A 1984 local Gardner area newspaper story, with a photograph of Carl and Cheryl Wilber, mentions a state police narcotics detective on the investigating team. It also notes the two people at the airport who witnessed and reported the plane flying approximately 60 feet above the runway, and that they stated that the plane was coming in with the runway lights off. Ronald Richard, one of the people mentioned in this 1984 article, recently noted that the plane, as it approached in darkness, had actually turned off its own aircraft lights and had also shut off the runway lights (which Richard, thinking the plane was having difficulty activating, had turned on himself). The airplane that crashed was a rented plane. Like many small, unmanned airports, the Gardner airport runway lights can be automatically and simply activated using a plane's radio transmitter. In addition to attempting a landing at night with no landing lights and no runway lights, neither the pilot (Principe) nor any passengers had filed a flight plan. Nor did anyone in the Gardner area come forward to say that they had been there to meet the four arriving passengers. And the airport has no public transportation. Nothing. The Gardner airport is not a choice spot to be during bad weather in late January --- it is generally unmanned and deserted even during daylight hours. What were four people doing as they swooped down on the airport in total darkness? On April 9, 1984, the report from the National Transportation Safety Board was published in the local papers, stating that they found the aircraft's light switch to be in the "off" position. Evidently someone made the decision that it was better not to be seen than to fly with visibility in the evening sky. Curious. Carl and Cheryl Wilber reported that they saw a large satchel or canvas bag at the crash site. It appeared full but they did not disturb it before going for law enforcement personnel. Upon their return two officers immediately located the satchel and walked away with it. That was the last time the satchel was seen by the Wilber's and interestingly these federal officers are not referenced in reports. What was in the bag and why was the satchel and it's contents never publicly reported? Were some amid the extensive search looking as much for the bag as for the plane and its passengers? Was a psychic fantasy considered a good cover-up story by two officers who took the satchel away? Herbert confirmed under oath that even prior to her first face-to-face meeting with Renier about 11 days after the crash, she gave Renier significant information. Together with the phone information she had given Renier the day before their meeting , she also provided Renier with the names of Civil Air Patrol personnel she (Herbert) was working with. In A Mind for Murder, Renier fails to mention that she had been given this critical information. 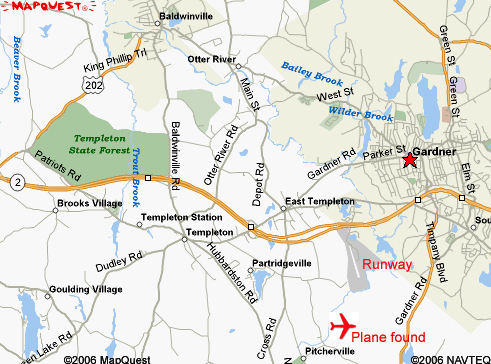 Jessica Herbert had even given Renier the name of the crash site area --- Gardner, Massachusetts! So the reality is that Renier was told of the crash location within 2700 feet of where the wreckage was ultimately found. But even with that information, Renier didn't pinpoint the last 2700 feet --- less than the length of the airport's runway. Noreen Renier supporter Daniel Grinnan, Jr., of the Bureau of Forensic Science, Commonwealth of Virginia, provided a public endorsement of Noreen Renier, noting "You definitely opened many eyes to the potential investigative tool of the psychic. Obviously, many a doubting Thomas had to revise his ideas concerning this somewhat esoteric area." Merrell notes "It certainly makes me wonder if the man knows the truth about this case or understands the differences between facts and delusionary exaggerations." Peter Slusar of the Peninsula Tidewater Regional Academy of Criminal Justice (Hampton, Virginia), previously noted Renier's "demonstrations and predictions were most accurate and although there still will be skeptics, you're able to have a lot of people leave with an open mind." By comparison, Albert Stone a Tennessee teacher who wrote to Merrell in 2002 included the comment that, "A froth has percolated for more than 30 years. Much of it has come from small southern communities that haven't moved beyond the investigative levels of 60 years ago. There is no excuse for law enforcement agencies to be dealing in the paranormal today. Soothsayers and mediums who speak with the dead are a poor excuse to replace a well equipped crime lab and properly trained investigators. Law enforcement personnel who approve pay for mediums or allow them to lecture should be promptly fired as they are both incompetent and delusional. ...They should be utterly ashamed of lending credibility to frauds." John Merrell noted in late 2005 that, "About every other month for many years a reporter would call me at work or home and ask why I had made up lies about a psychic who was clearly a hero. They assumed I'd admit to lying and furnish them with a direct quote to use. Instead, when I'd say I had no comment other than I hadn't lied in court, they'd respond that the jury had already determined otherwise, so it really didn't matter. American media compounded the story of a psychic finding a plane by failing to investigate. The stories produced over the past 20 years have combined mystery, entertainment, and the supernatural --- a quick write that is hard to resist by producers on the edge of entertainment rather than factual news." But these overwhelming facts are indisputable: Noreen Renier told millions of American television viewers, "I found a plane." And Noreen Renier wrote of this case in A Mind for Murder, "My clues had been accurate. . . . So much of my information was accurate. . . . The crash site was exactly the way I had described it. . . . Sitting on some flat rocks under a nearby tree, as if someone had placed her there, they found the headless body of a young woman." She repeated much the same statement on March 1, 2015. In reality there were no flat rocks under Carolyn Porter. There were no rocks at all. And there was no young man who took Carolyn in his arms and carried her away from the plane and sat her beneath a tree. In the November 9th 2006 issue of The Hook (Charlottesville, Virginia) private investigator Marlene K. Rockwell who has worked with Renier over the last four years at Rockwell Investigations, stated she's seen a compelling track record during that time. "Her information is incredibly accurate," Rockwell says. "She says she's 80-85 percent, but I found her to be about 95 percent accurate. I could never have imagined in my wildest dreams the information that she could provide." Can this be true when investigations into Renier's most publicly documented case find her at zero -- yes flat-out zero--- accuracy with just deceptions and whopping exaggerations? What kind of hard documented yardstick does Kansas based Rockwell Investigations use? Is an investigative team with a police psychic whom a federal court found "unquestionably breached" a court settlement an example of the "unstoppable team" described on the Rockwell Investigation web site? The November 16, 2006 order from the U.S. District Court (Western District of Washington at Seattle) states ". . . the record before the court shows that it is impossible that Ms. Renier breached the agreement in this case without some level of fault. She knew or should have known of the agreement, and breached it nonetheless." Authentic crime investigators can be both protective of the facts while abiding by legal sanctions. In a Court TV transcript taken from an interview, the narrator states, "By the way, that plane story she told is the same one she sued the skeptic over. Apparently some guy said she was lieing [sic] when she told that story, so she sued him and the FBI had to testify in the case." In the same transcript, Renier notes, "I don't really think there are skeptics though, maybe 'de bunkers' who are cowards." Before 2007 there are two principal science investigators whom Noreen Renier knew publicly examined this case. Both have a record of serving the public in their spare time. There is no report that either has ever been called a coward by anyone within their communities. And they have now been joined by more than a dozen others who have collaborated their findings and examined new ones as well. On January 28, 1984, four passengers died in the frozen and isolated blackness of the night near runway 18/36 as they headed south. They were discovered 13 days later, on the morning of February 10, following weather so severe that their bodies were glazed in snow. Described by Cheryl Wilber as appearing like "frozen white mannequins," four people were found in a scene of absolute calm. There is absolutely no evidence that they suffered or that any of the four lived beyond the instant of the crash. After 30 years the real circumstances of the crash have now been revealed. There was no heroic death scene on January 28, 1984 like the one Noreen Renier described to the Coast to Coast AM radio audience on March 1, 2015 where Arthur Herbert carried his headless companion and sat her under a tree. Nor was there the scene Noreen Renier described to a television audience where amidst suffering and a broken leg Arthur Herbert struggled to carry a dying Carolyn Porter in his arms from the plane and then lowered her gently against a tree. Neither of her delusionary visions ever happened. There was no tearful joint caress and no holding of hands before Arthur Herbert walked away in search of help. He did not stumble and collapse on his broken leg as he headed down a hill. And there were no cries of hunting dogs in the stillness. Instead, just seconds after the plane hit the treetops, it became pitch black. While the sky above had been crystal clear there were no nearby city lights and all of the plane lights had been shut off. Having crashed through a dense canopy of trees including hemlock, the plane dropped to the ground amid 25 meter tall trees. At 7:15pm the plane was entirely obscured from above. Dusk had been hours before. And the crash never created a fire. It was now total darkness in the last hours of the day. Five miles away in Baldwinville the afternoon temperature had averaged 7 degrees Celsius (45 degrees Fahrenheit) but had fallen to about -3 degrees (Celsius) and would reach a low of -7 degrees (19 Fahrenheit) within five hours. Amid the blackness the freezing winds would have continued to blow from across two thousand feet of open swamp just 22 meters away. The ground froze and the edges of the swamp were likely crusting over. With all four passengers dying instantly the only movement would have been broken tree branches snapping and collapsing around the plane. Four days later the temperatures in the area dropped to as low as -26 Celsius (16 degrees below zero). And for 12 days before the plane was found the evening temperatures remained below freezing with a total snow fall at the crash site estimated between 20 to 35 centimeters (8 to 14 inches). Large shallow areas of the nearby swamp froze over and became covered with snow creating unexpected hazards for search teams. On the morning of February 10th Carl Wilber and his 18-year-old daughter Cheryl followed deer tracks and found the plane. And now more than 3 decades later Noreen Renier's charade lies fully exposed. Yet even in February 2012 Noreen Renier was videotaped before the Clinton School of Public Service pushing much of the same charade about the crash as she does today. All of what she she told a radio audience of near 2.4 million listeners on March 1, 2015 has been shown as dulusions, lies, or con-artist hype. Some family members, and both readers and supporters of psychic investigator Noreen Renier, may have been offended with what this web site and its previous versions have revealed. It is likely Noreen Renier's most prominent psychic defender, Robert Ressler of the FBI, now knows the plane was not found by Noreen Renier. Mrs. Renier is a prominent police psychic and soothsayer. Her portrayals of speaking for the dead have been shown before millions of international television viewers and her 2005-2007 attorney was a former television producer. It is interesting that attorney cited privileged and truthful throughout the filings for a 80-year old psychic [as of January 11, 2017] who claims she talks with ghosts. Prior to a court ordering a second federal judgment against Noreen Renier in 2007, Noreen Renier's attorney cited first amendment rights. But United States District Judge James Robart noted in the court filing that "the authority that Ms. Renier cities in support of greater First Amendment restrictions is distinguishable. She mistakenly relies on Hustler Magazine, Inc. v. Falwell, 485 U.S. 46 (1988)." With her extravagant list of paranormal claims Noreen Renier sizzles before millions of TV viewers, having portrayed herself as a victim stabbed repeatedly. But Noreen Renier has also taken on the role before national TV audiences of becoming a serial killer, such as her appearance on the Joan Rivers show when she "became" the Zodiac Killer. For years stories have filled the airwaves about psychics finding a lost child, a lost man, a lost woman, a lost daughter, or a lost son. Yet none of these stories have included missing persons found alive and the "findings" have actually been done by others --- never has a psychic stood and pointed directly at the ground where a body was uncovered. If you believe you can cite a case we suggest it has as many holes as this one. Psychic Noreen Renier is a media extravaganza who claims to speak for dead murder victims and often has appeared on international television as "the voice" of those victims and some who have done the killing. Her claims of levitation, electrical manipulation, and the ability to see through clothing have been widely reported. On April 18, 2012 Noreen Renier received her fifth federal court judgment ordered against her since 2006 as she lost before the U.S. Court of Appeals for the Fourth Circuit Court --- a decision made before three judges --- and won by the investigator who first questioned her claims about this airplane case in 1985. The same critic, John Merrell, has now won other federal court judgments ordered against her in three additional federal courts. In late January 2015 he took down his own critical web site which showcased this case and encouraged other site managers to do the same. Less than 33 days later Noreen Renier once again pushed her 34-year old charade upon an audience of 2.4 million listeners. Guest host Dave Schrader asked her "Why is your name not more prevalent out there?" Mrs. Renier responded that "The skeptics came in. I have one in particular, there are two of them--- but they did so much damage to my career." This Global Net Research web site replaces the void created in January 2015 when previous web sites closed. GNR will provide a public platform record for Noreen Renier to clarify and respond to our findings. And GNR allows a fresh management team including global researchers and investigators to assist in further expansions, including those in our homelands outside the United States. Noreen Renier can no longer escape her own delusional tales and deceptions recorded on video and audio, nor her testimony. Or waste the resources of a few in answering legal filings. GNR has the synergistic support and means to defend attempts to silence the truth. In March 2011 Noreen Renier was found by a federal judge to have misled his United States federal court. In his ordered judgment against her noted that she was not a credible witness. Would the four passengers who died have wanted their deaths to be used to promote Noreen Renier on television and radio? Would they have wanted her fantasy about their deaths to help sell thousands of her books and DVD's? From the many GNR personnel worldwide, we thank you for your time. Please pass along the existence of our web site on links worldwide. This latest January 2019 report we believe requires extensive public distribution in order to counteract Noreen Renier's more than 34 years of marketed deceptions. Thank you again. Click here to go back to home page.